Dr Ilyas Mirza is a highly experienced Consultant Adult Psychiatrist currently working for Barnet, Enfield and Haringey Mental Health NHS Trust in the adult mental health services. He has a medical degree and is a Member of the General Medical Council, and the Royal College of Psychiatrists. 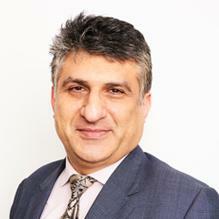 Dr Mirza has over 20 years’ experience working in the NHS and private sector. Dr Mirza currently has an honorary role within the Royal College of Psychiatrists as their Deputy Regional Advisor and Financial Officer (London Division). He also has a Research Doctorate in Medicine from the University of London and is currently the Research and Development Director for his NHS Trust. Dr Mirza is also an Educational Supervisor with the UCLP Higher Psychiatric Training Scheme. Dr Mirza is described by his colleagues as dedicated and knowledgeable, offering great respect to his patients, and working collaboratively towards outcomes which are a priority for his patients. Clinical Partners are delighted to present Dr Mirza to our London patients. You don't need a GP referral to see Dr Ilyas Mirza.